Yang Lu-ch’an’s family was a poor farming/worker class from Hebei Province, Yang Lu-Ch’an or Yang Lu Chan, also known as Yang Fu K’ui or Yang Fu Kui (1799–1872), born in Kuang-P’ing (Guangping), was an influential teacher of the internal style martial art T’ai Chi Ch’uan (taijiquan) in China during the second half of the 19th century. He is known as the founder of Yang style Tai Chi Chuan. Yang Lu Ch’an’s family was a poor farming/worker class from Hebei Province, Guangping Prefecture, Yongnian County. Yang would follow his father in planting the fields and, as a teenager, held temporary jobs. One period of temporary work was spent doing odd jobs at the Tai He Tang Chinese pharmacy located in the west part of Yongnian City, opened by Chen De Hu of the Chen Village in Henan Province, Huaiqing Prefecture, Wenxian County. As a child, Yang liked Martial Arts and studied Changquan, gaining a certain level of skill. One day Yang reportedly witnessed one of the partners of the pharmacy utilizing a style of martial art that he had never before seen to easily subdue a group of would-be thieves. Because of this, Yang requested to study with the pharmacy’s owner, Chen De Hu. Chen referred Yang to the Chen Village to seek out his own teacher—the 14th generation of the Chen Family. After mastering the martial art, Yang Lu Ch’an was subsequently given permission by his teacher to go to Beijing and teach his own students, including Wu (Hao)-style T’ai Chi Ch’uan Wu Yu Hsiang and his brothers, who were officials in the Imperial Qing dynasty bureaucracy. In 1850, Yang was hired by the Imperial family to teach Taijiquan to them and several of their élite Manchu Imperial Guards Brigade units in Beijing’s Forbidden City. Among this group was Yang’s best known non-family student, Wu Quanyou. Wu first Kung Fu Wu Family T’ai Chi Ch’uan (吳家太極拳) Chien-Ch’uan T’ai-Chi Ch’uan Association. This was the beginning of the spread of Taijiquan from the family art of a small village in central China to an international phenomenon. A Perspective on the Development of Taijiquan – Qi, The Journal of Traditional Eastern Health and Fitness Vol.8. 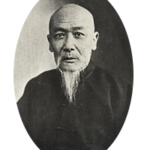 Due to his influence and the number of teachers he trained, including his own descendants, Yang is directly acknowledged by 4 of the 5 Taijiquan families as having transmitted the art to them. *Once while fishing at a lake, two other martial artists hoped to push Yang in the water and ruin his reputation. Yang, sensing the attacker’s intention, arched his chest, rounded his back, and executed the High Pat on Horse technique. As his back arched and head bowed, the two attackers were bounced into the water simultaneously. He then said to them that he would be easy on them today; but if they were on the ground, he would have punished them more severely. The two attackers quickly swam away. *In Beijing, a rich man called Chang heard of Yang’s great skills and invited him to demonstrate his art. When Yang arrived, Chang thought little of his ability due to his small build—Yang simply did not “look” like a boxer. Yang was served a very simple dinner. Yang Lu-ch’an continued to behave like an honored guest, despite his host’s thoughts. Chang later questioned if Yang’s Taijiquan, being so soft, could actually be used to defeat people. Given that he invited Yang on the basis of his reputation as a great fighter, this question was a veiled insult. Yang replied that there were only three kinds of people he could not defeat: men of brass, men of iron and men of wood. Chang invited out his best bodyguard, Liu, to test Yang’s skill. Liu entered aggressively and attacked Yang. Yang, employing only a simple yielding technique, threw Liu across the yard. Chang was very impressed and immediately ordered a banquet to be prepared for Yang. The ones living in the USA are Stephen Tang, Wen Mei Yu and they both teach Shifu Marquez.